A lot of people wonder what type of human food they should feed their Golden. Even though many prefer to stick with dog food and only dog food, there are certain types of human food that Golden Retrievers love – and is actually good for them. Golden’s crave attention as we all know – and when they watch you eat it never hurts to give them a bite – as long as you know what they should and shouldn’t consume with their diets. If you feed your Golden a large amount of egg white in his diet, he will get a deficiency in biotin, which is a B vitamin, due to the amount of avidin, which is a very destructive substance. If you are feeding your Golden Retriever egg yolks, you shouldn’t worry as the effects of avidin will be offset by the high biotin levels that are found in egg yolks. You can also feed your Golden egg shells as well, as they contain a large amount of protein. If you want the best for your Golden – try feeding him raw eggs – with the shell intact. We all know never to feed chocolate to any type of animal. Chocolate contains bromine, which is very toxic to both dogs and cats. Unsweet chocolate is by far the worst to feed to your Golden, as it contains a large amount of bromine. Bromine is a very harmful chemical, one that normally leads to death of your animal should he be fed any type of chocolate. There are other foods out there that can be good or harmful to your Golden. If you have any questions, you should always ask your veterinarian. 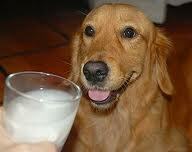 Your vet will be able to recommended real food that is beneficial to your Golden, as well as foods you should avoid. You can experiment with real food if you like – although you should never allow your Golden Retriever to consume any type of chocolate.